Your Trustworthy Auto Repair Shop in Columbus WI. Your car, truck, or SUV is in good hands with the skilled auto mechanics at our car repair shop in Columbus, Wisconsin. The team at JRC Enterprises Auto Repair and Machine Shop is proud to provide you with top-notch repairs for foreign, domestic, and hybrid cars and trucks. We also offer a complete, in-house engine machine shop to meet your every automotive need. For your convenience, our automotive and truck repair shop offers flexible hours. We are convenently located in the middle of Columbus, DeForest, Sun Prairie, Marshall & Waterloo. We are open on Saturdays by appointment, and if you need to pick up your car after our regular hours we’ll be happy to stay late in order to accommodate your schedule. Turn to JRC Enterprises Auto Repair and Machine Shop when you’re in need of an all-inclusive engine replacement or engine rebuilding service. Come in for a standard Oil Change and we will donate 50% of the proceeds to St. Jerome School. Contact us in Columbus, Wisconsin, to request an estimate from our established auto repair shop. © 2016 - 2019 JRC Auto Repair and Machine Shop, All rights reserved. 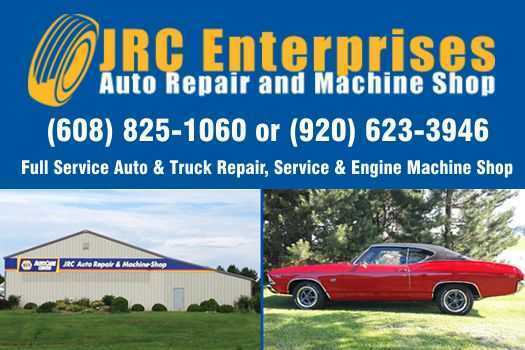 Page Summary: JRC Auto Repair and Machine Shop offers mechanic, car repair, auto shop and auto repair shops. Services such as auto care, car care, automotive machine shop near me as well as auto repair estimates are also part of the scope of our business. We also specialize in engine repair, car repair estimate in Columbus WI, Sun Prairie, Beaver Dam as well as Madison. Other areas we serve include De Forest, Waunakee, Waupun and Watertown. We also service Mc Farland, Lodi and beyond.